Summertime in Boston calls for patio drinks on the regular. That’s why Tablelist has teamed up with Cheers dating app to throw an epic after work event at Alibi Patio, one of the city’s best outdoor spaces. Want an invite? Read on! 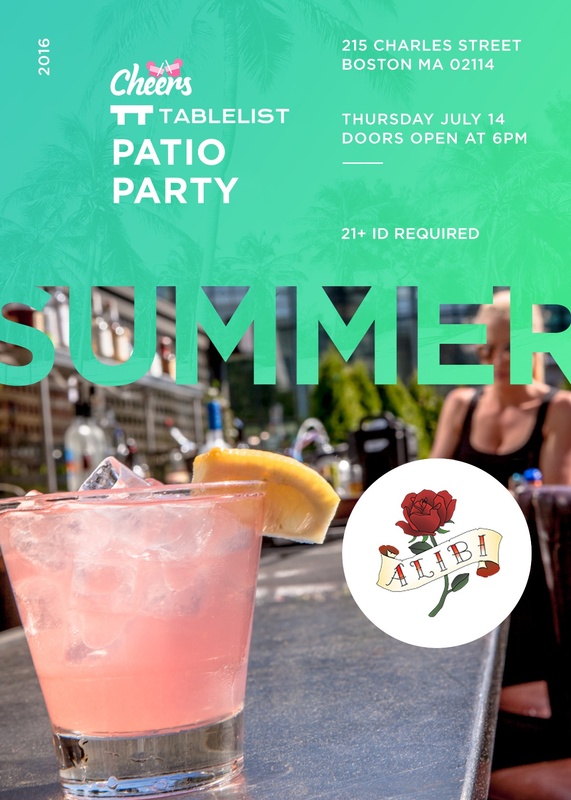 You’re Invited: Tablelist has teamed up with Cheers to throw an epic patio party, Thursday 7/14 at Alibi. Want to score an an exclusive invite, plus drinks on us the event? Simply apply for Tablelist Platinum, Boston’s private community that provides complimentary access to the best venues and events in the city, as well as members only upgrades and perks. Apply for Tablelist Platinum now with the code CHEERS by this Friday 7/8 and you”ll score an invite to the party, plus the chance to get a month of Platinum membership on us.